How Much is Native Title Worth? While commerce is an activity typically driven by self-interest, its proper functioning is underpinned by values of trust and co-operation, honesty, reasonableness, fairness and certainty. This article looks to the sources and nature of the values that underpin commercial life and their expression in commercial law through the development of certain principles and rules of the common law, Equity and Admiralty. These include the way in which contractual good faith or fair-dealing might be seen and engaged as an organising or informing principle of commercial law; notions of fairness in maritime law; conscience and unconscionability in the operation of equitable doctrine; and the development of a business or trade conscience in statutory provisions, including in consumer law. 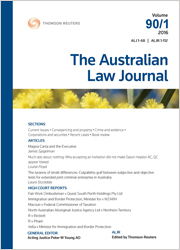 Drawing on the history of judicial and institutional law reform in Australia and other common law countries, the author recalls the heyday of the law reform commissions (LRCs) in the 1980s-1990s. He then describes the decline in the size, activities and support for LRCs in Australia. He postulates the reasons for this decline and the resulting diminution in professional, academic and public involvement in law reform. The particular seriousness of this development in Australia is suggested and the need to reinvest in LRCs is urged. The prognosis is guarded. For the PDF version of the table of contents, click here: ALJ Vol 91 No 10 Contents.